Live In The Moment…Not the future, Not the Past! This seems to fit my current days perfectly and helps to provide me with peace of mind of sorts each night…literally. I read this phrase each night before bed (and sometimes throughout the day) and I have been doing so for years. At some point in time it just became routine that I read these few words and I honestly didn’t think too much about what once meant so much to me but lately I have started to take the time to read, analyze what may have gone wrong throughout the day and realize that the day to come has nothing but opportunities waiting for me. My life has been very hectic over the past year with the passing of my 15 year-old step son, birth of my new boy, Reid, gaining more custody of my other biological son who is just about 8 and trying to stay in the good but respected graces of my step-daughter who is reaching that tough “tweenie” age. Oh, I forget to mention having to move houses due to the memories left in the old house where we lost my step-son and now facing potential surgery on my lower back which I have tried to avoid for well over a year. With all those things going on I feel as if I have lost sight what is important in this crazy life. I had been focused on work, managing money (sort of), myself (as in selfishness) and almost totally disregarding what my immediate family (wife and kids) and confidents needed from me. I’ve stepped back a little to think about those strong words from R.W. Emerson I read each day and have concluded that yes, something “wrong” or nonsensical happens on a daily basis but it is certainly not the end of the world. I need to try and leave those hiccups behind me and move forward. They (whoever “they” is) say that you can’t move forward if you’re always focusing on the past and that’s the truth. I have a responsibility to forget the absurdities that have taken place each day and be there for my family, friends, and myself…physically and mentally. I need to nurture relationships (such as with my wife and kids) and take care of my health so I can grow old in a healthy way and be a role model for my young children as I am certainly not the youngest Father of an 8 month old baby! I don’t need to worry about how many thousands of dollars are in a bank account or mutual fund I haven’t looked at in years, I don’t need to worry about being “popular” among the big-shots of the area. I need to be popular with my loved ones because at the end of my life they are going to be ones whom I have made a true impact on. I could go on and on about this topic all day but I realize that I’m getting quickly of track. The bottom line is that I need to focus on each day and be the best me I can be. I need to embody and expose the values I hold dear and share them with my loved ones and not get side-tracked with “material” or unimportant things even if I did the day before. 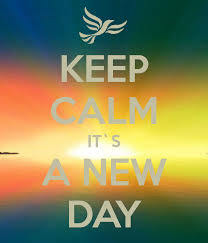 Each day is fresh and new and I can make it what I want it to be regardless of anything that crept in the day prior. I vow to begin doing that to the best of my ability. I know I won’t be perfect and I will have days where I forget this truth but that’s life. For now, I’m in a good place and plan on staying there. If I sway too far off track there’s always the next day to catch the right trail to happiness! Topics Select Category Attitude bad methods co-parenting Daily Grind Enthusiasm Entreprenuership hmmm Making Changes Quotes For Life Sharing Social Media stepparents Thoughts Uncategorized Veterans Yeah…We Never Would Have Guessed!